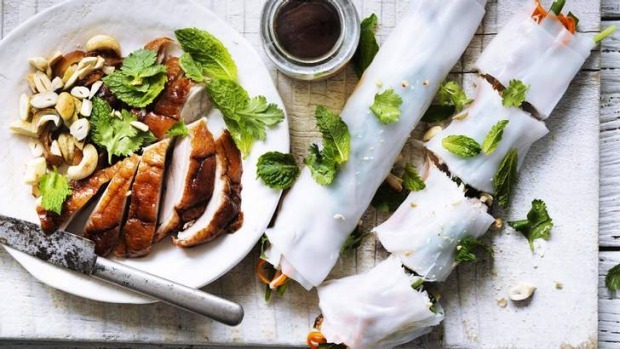 These rice paper rolls are delicious as finger food or as part of an Asian feast. Rice paper rolls are best eaten as soon as they're made. Don't put them in the fridge: the rice paper will become hard and chewy. PEEL CARROT AND DAIKON and cut into matchsticks. Cut cucumber into matchsticks, discarding the seeds in the centre. Mix vegetables together in a bowl with the sea salt and leave for 10 minutes. HEAT SUGAR AND VINEGAR together until sugar dissolves, then pour hot liquid over the vegetables. Leave to pickle overnight. COMPLETELY IMMERSE dried rice noodles in hot water for at least 1 hour, until soft and flexible but still firm. Drain well and place in a large mixing bowl. ROUGHLY CHOP the cashews. Tear the mint leaves. Add both to a mixing bowl along with drained pickled vegetables and coriander. Mix through just enough nuoc cham dressing to coat and flavour the mixture. Check seasoning. REMOVE DUCK MEAT from frame. Cut breast into 1cm-thick pieces. Shred the leg meat into pieces about the same size. FOR THE SAUCE, whisk ingredients together and check the flavour balance. IF USING dried rice paper, work with one sheet at a time: briefly soak one in a shallow bowl of warm water until it's pliable. Transfer to a damp, clean tea towel. Place some of the noodle and vegetable mixture in the centre of one sheet. Add a few pieces of chive and some duck. Roll over one edge, fold in sides, then continue to roll firmly to seal. FOR FRESH rice paper sheets, soften contents of a packet in warm water to gently separate the sheets, then drain and pat dry. Follow instructions as before but simply roll up, leaving ends open. Repeat with remaining ingredients, keeping rolls covered with a damp cloth, until ready to serve. CUT ROLLS, place on a platter and serve with dipping sauce.